« Allergies or asthma driving you mad? Late winter and early spring are considered Kapha Season in Ayurveda. This means that we can adjust our daily lifestyle choices to find balance in body and mind. When one quality is present (for example, cold), we create balance by adding the opposite quality (hot). Kapha dosha is dominated by the water and earth elements. If you mix water and earth, you create mud. It makes sense that kapha energy is heavy, sticky, lubricated, steady, cold and nurturing. Just like the fertile mud gives rise to beautiful plants and flowers, kapha energy stabilizes us for growth. 1. Exercise every day! This is especially important for people with a Kapha-dominant constitution. Walking, swimming, biking, running and yoga are all good choices. Since we remove ama (toxins) through movement and sweat, this one tip will make a huge difference. 2. Add some spice to your life. 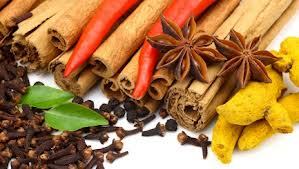 Sprinkle cardamom, wasabi, cayenne, ginger, garlic, cloves, cinnamon, pepper and mustard seed on your food to add heat and spark agni, the all-important digestive fire. Foods that are dry, warm and spicy clear congestion and keep things moving. 3. Sip warm water. Warm foods and drinks are easier to digest and help keep us regular. Consider warm water with 1/4 tsp cayenne powder, 1 tbsp lemon juice, and 1 tsp raw honey for a detoxifying tea. 4. Breath freely by using a neti-pot. Since Kapha dominates the chest and upper stomach regions of the body, it’s wet and sticky nature causes mucus to get stuck. The neti-pot helps flush out mucus and seasonal allergens. 5. Favor light fruits like apples, pears, pomegranates and apricots. Avoid heavy fruits like bananas, avocado, pineapple, orange, dates and figs. 6. Declutter! Kapha-dominate people tend to collect things. This type of material “congestion” weighs us down. Instead, spend a few minutes each day recycling papers, donating clothes or cleaning things up. It will help you feel free and light in mind and body. Incorporate these tips to breathe freely and enjoy balance during this beautiful season. Nicole Perriella is an Ayurvedic Health Coach and Hatha Yoga Teacher at the Glow Natural Health Center in Seattle, WA. Through diet, lifestyle, herbs, yoga, meditation and pranayama, Nicole guides clients to correct imbalances to look and feel their best. Her writing has been featured on Seattle Seedling, Ayurveda Apothecary and Everyday Ayurveda. Learn more at www.nicoleperriella.com.